Increasing iron dosage in newborn pigs improves suckling and subsequent nursery performance and Fe status. Newborn pigs develop iron deficiency in the first week of life due to small Fe storages at birth, low levels of Fe in sow colostrum and the rapid growth rate that occurs during this period of a pig’s life. Because of this, an Fe injection within the first week of birth is commonly used in the swine industry to prevent Fe deficiency and the injection is typically dosed at 200 milligrams of Fe from iron dextran. The negative consequences of absence of an Fe injection during this period on piglet growth and subsequent nursery performance is well established. Furthermore, research has determined that an extra injection of 100 mg of Fe from iron dextran at Day 10 of age can improve Fe status at weaning and initial post-weaning performance. A commercial product containing gleptoferron which is a Fe macro-molecule complex is used as an injectable Fe source for suckling piglets. Therefore, the objective of this study was to determine the effects of increasing injectable Fe in newborn pigs on suckling and subsequent nursery performance and blood criteria. To evaluate the hypothesis, a total of 28 litters were used with the number of pigs per sow equalized on each day of farrowing. On the day of processing (approximately three days after birth), all piglets were weighed, and, within litter, six barrows and six gilts were allotted to one of six treatments in a completely randomized design. There was one barrow and one gilt per treatment for each sow. The six treatments consisted of a negative control receiving no injectable Fe or 50, 100, 150 or 200 mg Fe provided in one injection on approximately Day 3, or a treatment with 200 mg provided on Day 3 plus another 100 mg injection on Day 11. Creep feed was not offered to suckling pigs. Pigs were then weaned at approximately 21 days of age and allotted to pens based on body weight and previous Fe treatment in a completely randomized design with five or six pigs per pen and 10 pens per treatment. Common nursery diets were fed in all nursery phases. Nursery diets contained 110 ppm Fe from ferrous sulfate provided by the trace mineral premix. In farrowing, increasing injectable Fe up to 100 mg improved average daily gain and Day 21 body weight with no further improvement thereafter. There was no evidence of differences between the 200 mg and 200 mg plus 100 mg treatments for sucking growth rate. For the nursery period, increasing Fe dosage post-farrowing improved ADG, average daily feed intake and Day 42 body weight. Also, increasing injectable Fe up to 150 mg improved F:G with no further improvement with increased dosage. There was no evidence of differences between the 200 mg and 200 mg plus 100 mg treatments for growth. 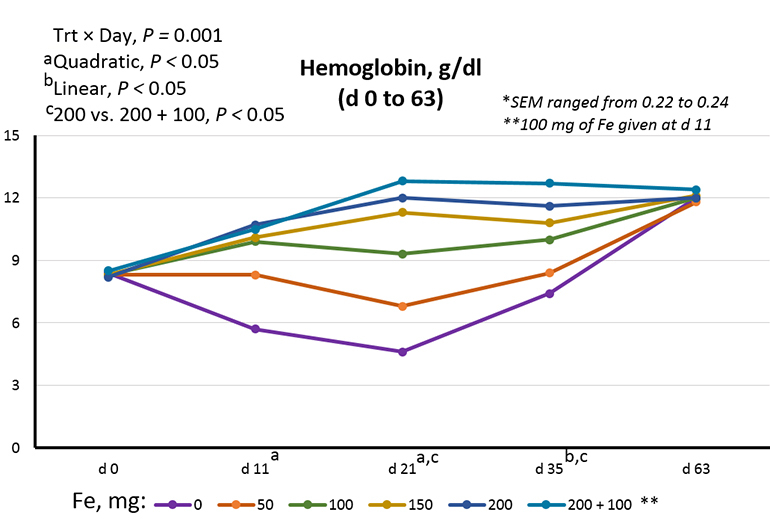 Significant treatment times day interactions were observed for hemoglobin and hematocrit. The interactions occurred because pigs that had less than 150 mg of injectable Fe had decreased values to Day 21 and then increased to Day 63 with the feeding of common diets. Conversely, pigs receiving 150 or 200 mg of injectable Fe had increased values to Day 21 then stayed relatively constant to Day 63. 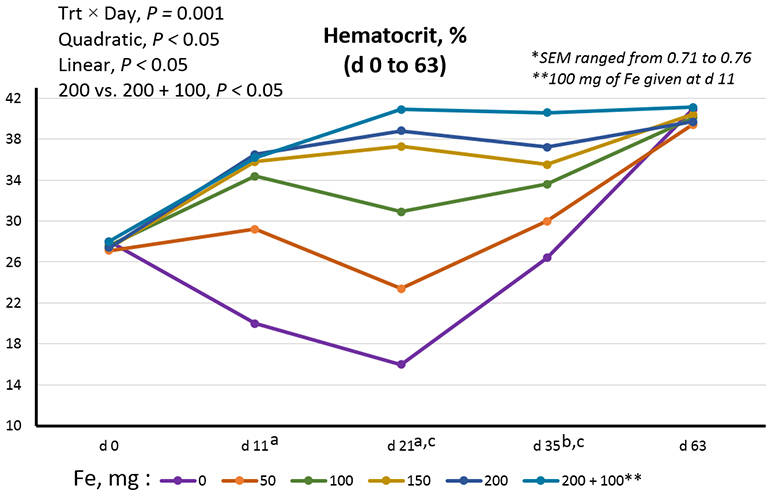 There was no evidence of treatment differences observed for hemoglobin and hematocrit values measured on Day 63. On Day 21 and 35, pigs that received the 200 mg plus 100 mg treatment had increased hemoglobin and hematocrit values compared to the 200-mg treatment. In summary, up to weaning, a 100 mg injection of Fe maximized growth performance during lactation, but for subsequent growth performance in the nursery, the 200 mg injection maximized growth performance. The addition of a 100 mg booster of Fe administered at Day 11 of lactation did not provide a performance benefit in either lactation or the nursery. For blood criteria, 200 mg of Fe is the optimal dosage for the greatest Fe status at weaning and in the nursery. A 100 mg booster injection midway through lactation has the ability to improve blood Fe status through weaning and the first phase of the nursery, but no additional benefits are observed for growth performance. Also, we observed that by Day 42 in the nursery, feeding diets that are sufficient to meet the pig’s Fe requirement restored blood Fe measurements in pigs that received low doses of injectable Fe at Day 3 processing during lactation with hematological indicators at the end of the nursery being similar to those that received the high doses of Fe. Nursery performance of these pigs receiving a low Fe injection was still poorer than that of the piglets receiving the higher dosage.